Mitch McConnell vs. Mother Jones: McConnell says left was "bugging" his office. U.S. Sen. 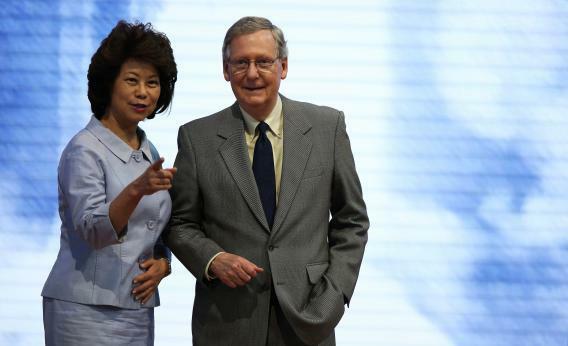 Minority Leader Mitch McConnell (R-KY) stands on stage with his wife, former U.S. Secretary of Labor Elaine Chao ahead of the Republican National Convention on August 26, 2012 in Tampa, Florida. The Senate Republicans’ weekly post-lunch press conference stuck to the issues of a week until near the end, when a reporter asked about the “secret tape” of a Kentucky campaign session, published today by Mother Jones. McConnell and the NRSC have moved aggressively to judo-flip the story, turning it from a question of offense or gaffes—which, to be fair, didn’t come from McConnell’s mouth in the tape—to a story of illegal bugging. Right now there’s no evidence that reveals the origin of the tape—whether it was produced by bugging (which is illegal) or a recording from an errant staffer (less illegal). But this is McConnell’s fight back story.